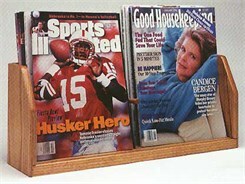 Counter top literature holders display magazines, forms and brochures in an orderly and attractive fashion. Constructed of solid oak sides and bottoms with oak veneer backs. Clear acrylic front panels protect and provide easy viewing. 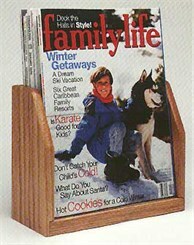 Order the 8 Pocket Brochure Rack here as No. Y2310; order other sizes below. 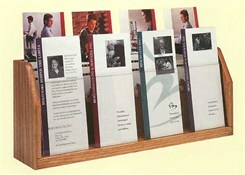 The 8 Pocket Brochure Rack has pockets that measure 4" wide; the back row is elevated for ease in viewing. 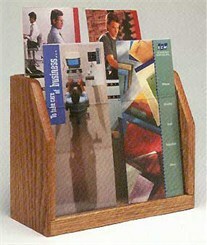 Overall 18-1/4"W x 4"D x 7-1/2"H. Shpg. wt. 5 lbs. PRICE INCLUDES FREIGHT! Please allow 1-2 weeks for delivery. Pocket is 4" wide. Overall 5-1/4"W x 4"D x 7-1/2"H. Shpg. wt. 3 lbs. PRICE INCLUDES FREIGHT! Pockets are 4" wide; back row is elevated for ease in viewing. 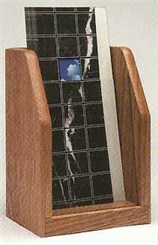 Overall 9-1/2"W x 4"D x 7-1/2"H. Shpg. wt. 4 lbs. PRICE INCLUDES FREIGHT! Pocket is 8-3/8"W x 2-1/4"D. Overall 9-1/2"W x 4"D x 7-1/2"H. Shpg. wt. 4 lbs. PRICE INCLUDES FREIGHT! Pockets are 8-3/8"W x 2-1/4"D. Overall 18-1/4"W x 4"D x 7-1/2"H. Shpg. wt. 6 lbs. PRICE INCLUDES FREIGHT!